Home News NCLB South Bay Chapter in California!! NCLB South Bay Chapter in California!! 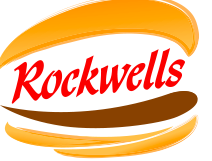 NCLB SB‘s activities would not be possible without the generosity of several restaurants in Southern California, whose names and locations can be found on our Partner Restaurants page. As an introduction to NCLB SB, the following is an excerpt from an essay KD wrote at the conclusion of the school year to summarize her activities. It should be noted that American Martyrs is a Catholic school, though NCLB is a completely secular organization. However, we welcome assistance and involvement by members of all faiths, and by those whose faiths inspire them to join us. Since the writing of this essay, NCLB SB has continued to thrive, sending nearly 5000 crayons to Guatemala. We expect to see great things from this chapter, whose activities prove just what a smart, driven and compassionate 13 year old can accomplish, especially when getting support from her friends, her community, and her parents. 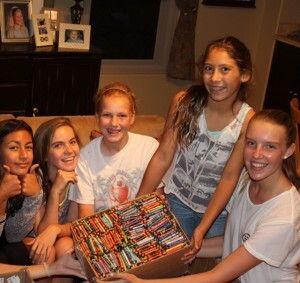 KD and friends prepare crayons to be donated to an orphanage. As KD states in the essay, she intends to maintain this chapter far beyond the school project from which it originated. The saint I can most relate to is St. Benedict of Nursia, the patron saint of schoolchildren, because I can relate to his works. Last summer, I began working with an organization called No Crayon Left Behind (NCLB), which was started by a family friend. NCLB is a non-profit organization that collects the gently-used crayons that kids leave behind at restaurants once they are done with their meals. Once the crayons are collected, I bundle them and donate them to local schools, shelters, and orphanages. St. Benedict has taught me to treat others kindly and love those who may not be as fortunate as I am. He has, and continues to, inspire me to do NCLB. I will continue to do this project throughout high school and hopefully for many years after that. Through NCLB, I have had the privilege of meeting nuns, principals, young children, founders of shelters, and deacons. My most memorable experience with NCLB is most definitely when I delivered crayons to Covenant House shelter in Hollywood, California. Sister Margaret, the director of Covenant House, was very patient, kind, and open to NCLB. I got the opportunity to meet some people living at the shelter and take a tour. Hearing her stories about people coming from off the streets to live at Covenant House was truly incredible. The gratitude I had for my life and the privileges I had after hearing those stories was overwhelming. After providing crayons for Covenant House, Sister Margaret delivered crayons that I had provided to children living in an orphanage in Tijuana, as well as a garbage dump. Yes, a garbage dump. 450 bundles of our crayons (about 2,000 crayons in total!) were delivered to underprivileged children throughout Sister Margaret’s trip. We have also provided a total of 1,640 bundles of crayons (6,480 total crayons) to local schools, orphanages, and organizations, and we are currently in the process of preparing 350 more bundles to go to three other schools. St. Benedict’s drive to help others inspires me to continue NCLB. I have learned not to take things as simple as a few crayons for granted, because not everyone has the privileges that I have.